The Hawaiian tree fern (Cibotium glaucum) in Hawaii Volcanoes National Park on the island of Hawaii. 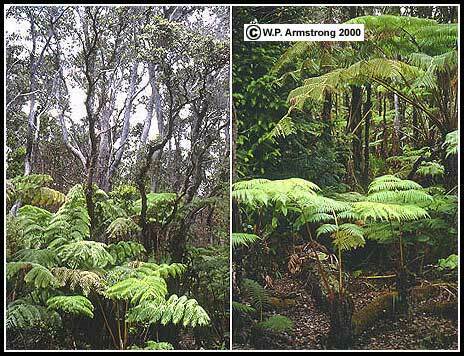 These beautiful native ferns form a dominant understory component in forests of ohia (Metrosideros polymorpha). Ancestral fern spores seeded these isolated volcanic islands millions of years ago. They were possibly carried by strong winds and air currents, long before the arrival of the first Polynesian sailors. 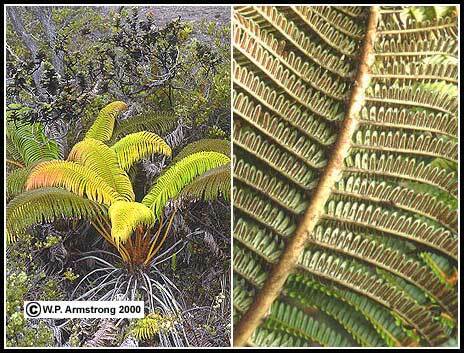 The Hawaiian tree fern and Tasmanian tree fern (Dicksonia antarctica) belong to the dicksonia family (Dicksoniaceae). Australian tree ferns of the genus Alsophila, including the commonly cultivated Alsophila australis, belong to a different family of tree ferns, the Cyatheaceae. Sadlera cyatheoides, an endemic Hawaiian fern that commonly grows on lava flows around Kilauea Crater. On the underside of the smallest leaf divisions (pinnules) is a brown linear sorus (sporangia cluster). This fern is one of the first plants to colonize lava flows after an eruption.